From the Apache Wash Trailhead you need to start on the Apache Wash Loop Trail. 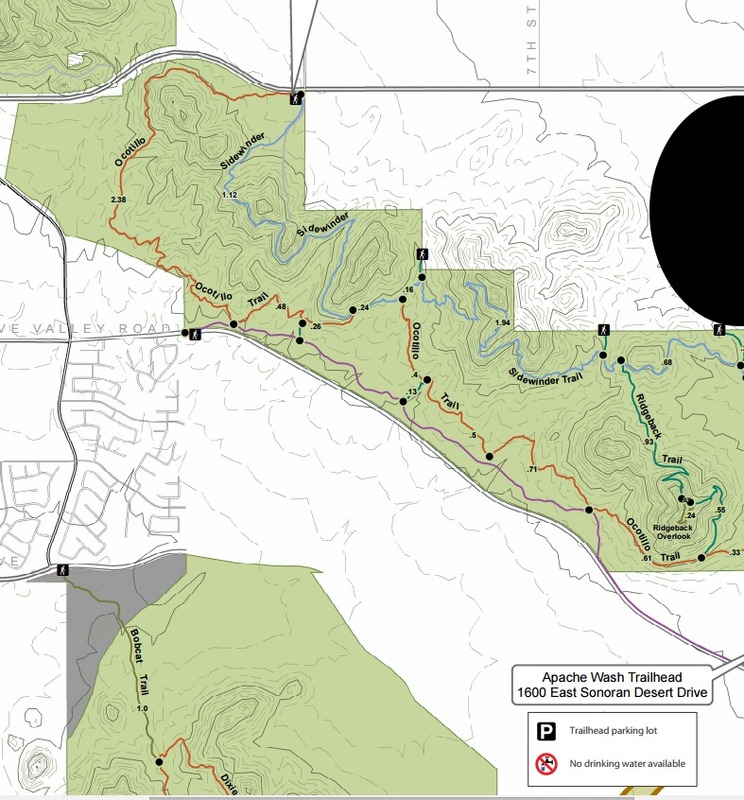 Hike for a half mile then connect to the Badger Brawl Trail for the next 1.55 miles where you will reach the Cliff Walk Trail. The Cliff Walk Trail is 2.88 miles one way. Once you are on this trail it is easy to figure out where the name came from. 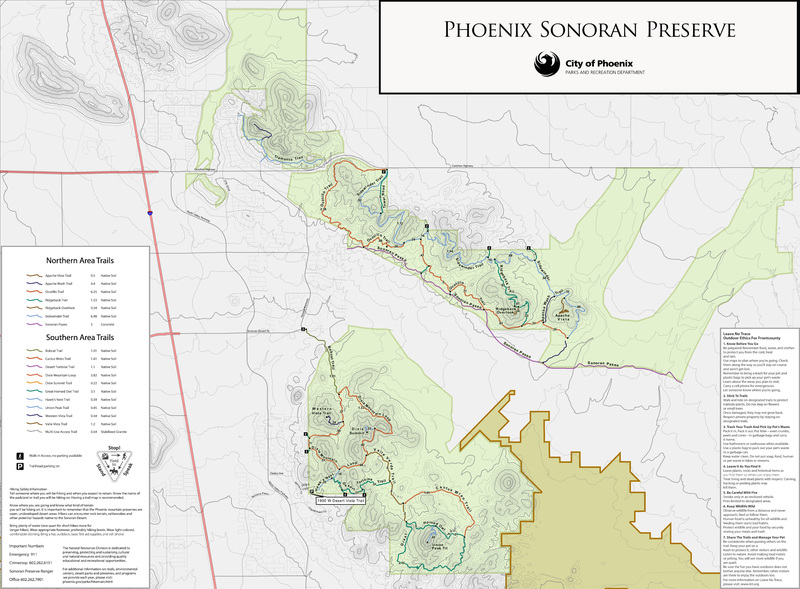 The trail follows the Cave Creek river bed for its entire length. The trail has some great views of the area and is well marked all way. I did not see any other hikers on trail but did see about a half a dozen bike riders. It seems like a great place to ride bikes too. Lots of birds and butterflies witnessed on my February hike. My hike started at Apache Wash Trailhead. I hiked to the end of the Cliff Walk Trail which ends at a bridge on the E. Carefree Hwy. From there I retraced my route back to the Apache Wash TH for a 10.15 mi out-n-back hike. There may be unofficial places to park near the north end of the trail along the E. Carefree Hwy. 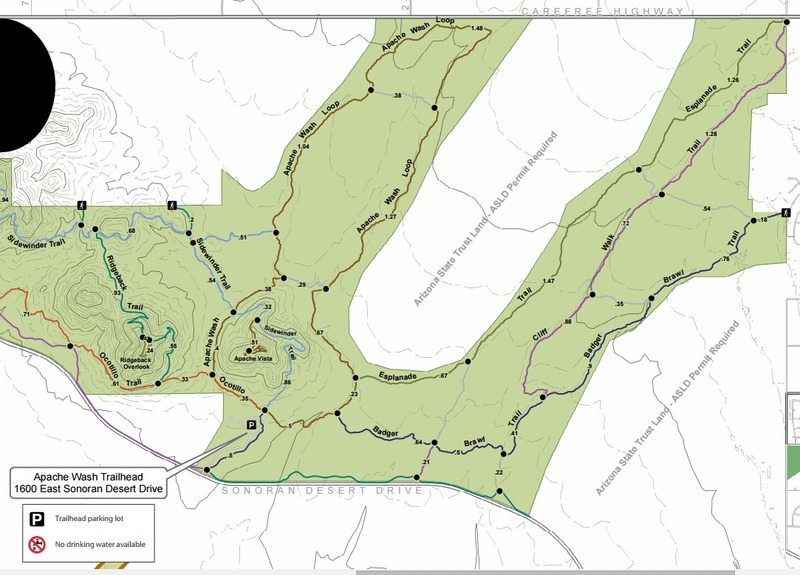 Which in theory would allow you to do a 6 mi out-n-back hike. From Phoenix take the 101 east and exit on N Cave Creek Rd. Head North until you reach E.Sonoran Desert Dr. Turn left and drive about five miles and turn right on Apache Wash Trailhead. There are restrooms at the trailhead but no drinkable water.